History of WGUL Radio Station, New Port Richey, Florida. Pictures of WGUL are here. Video clips are on YouTube 1, 2, 3, 4. This page is maintained by Jeff Miller, who worked at WGUL in the 1980s. I welcome contributions of information and pictures. The page was last revised on Nov. 16, 2011. In August 1963, the call letters WGUL were assigned to the station, licensed to Jasmin Properties Inc.
An article in the New Port Richey Press on Oct. 12, 1961, predicted the area's first radio station would go on the air "next spring" if approved by the Federal Communications Commission. The article made reference to the call letters WNPR and indicated the station would operate on 1400 kilocycles with 250 watts daytime. It is likely that the 1400 is an error and should be 1500. WGUL 1500 AM signed on the air at 7 a. m. on October 31, 1963. 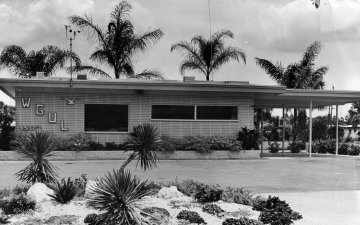 The original location was on U. S. Highway 19 in New Port Richey, with the studio and transmitter situated on opposite sides of the highway. WGUL was a 250-watt daytime only station, although it was required to operate at a power level under 250 watts to compensate for the high radiation efficiency of the half-wave tower. On Nov. 22, 1963, WGUL announced that President Kennedy had been shot, reading the bulletins from the AP news wire. Thad Lowrey recalled in 2008 that listeners to the three-week old station did not believe the station was broadcasting truthful information and called the station in anger. Lowrey also recalled that WGUL did not have much of a selection of music at the time and the announcers asked listeners to loan the station records appropriate to play during this period. Lowrey recalled that the station played no commercials for several days. Joseph Jankowski (1925-2007) became an announcer at WGUL in 1963 and later sales manager of the station, according to his biography. He is the author of numerous poems and short stories. On Sept. 18, 1964, the FCC approved assignment of the license from Jasmin Properties Inc., owned by W. C. Tranter, Ronald C. Tranter, Sam Y. Allgood, and Reginald Sims, to Richey Airwaves Inc., owned by Donald Armstrong, Thad M. Lowrey, Sam Y. Allgood, W. C. Tranter, Ronald C. Tranter, Reginald Sims, and Marie Armstrong. WGUL AM 1500 programming in the 1960s was directed at the local New Port Richey community and the station was very involved in local activities. Open Line, hosted by Thad Lowrey, was a popular call-in talk show that began in the 1960s. In the afternoon, after school let out, WGUL broadcast Teen Time, with music designed for teen-agers. An advertisement for WGUL in the 1965 Gulf High School yearbook indicated Tom Dixon was the host of Teen Time. In the 1960s, WGUL AM 1500 broadcast the local Gulf High School football games by tape-delay on Saturdays since it was limited to daytime-only broadcasting. In the fall 1969, WGUL-FM, which was not limited to daytime broadcasting, signed on, just in time to carry the local high school football games live on Friday nights. According to Broadcasting Yearbook, the FM station began broadcasting on Sept. 19, 1969. The original frequency was 105.5 MHz. Some of my fondest memories of WGUL are from the early years (1967 until moving to the new building and switching to The Music Of Your Life). We used to be THE source for news locally and were unbelievably popular. We even broadcast the Chasco Fiesta Parade on radio! I remember sitting on the curb on Main Street in front of the funeral home and Adamek lumber and describing the floats as they went by! The 1969 Broadcasting Yearbook shows WGUL (AM only) on 1500 with 250 watts daytime. The licensee was shown as Richey Airwaves Inc. Personnel shown were Don Armstrong, President, and Thad Lowrey, Station Manager. In February 1973 the hours of operation of WGUL-FM were extended from 10 p.m. to midnight. One of my memories as an announcer at the station was being told that one of our clients, a Sewing Machine center, located not too far from the base of our tower across the highway, had a sewing machine that "picked up" our station. I went to see, or hear it, for myself. Sure enough, one of their sewing machines sitting on the showroom floor did indeed sound like a small portable radio tuned in perfectly to WGUL. I incorporated this little bit of electronics trivia into a commercial spot I did for them later. "And while you're there (at the store) be sure to ask (the owner) about their new (whatever brand) sewing machine that prefers WGUL to any other radio station in the Bay area.” Or some such drivel. My most vivid memories are associated with Thad Lowrey and the 3 Don Armstrongs who made up the senior staff. Don Jr and I, in fact, worked together afterwards, however briefly, in Panama City. He is one of the more unforgettable personalities I've had the pleasure of associating with in the roughly quarter of a century I spent on radio. I also ran into Matt Johns some years later when I was on staff at what was then 570 WHNZ (in the early '90's). And I believe Dave Harrell is still on the air in the area, either at WDUV, or a station south of the bay somewhere that emulates their image and format. Another unforgettable character is Steve Diller, who also is probably still terrorizing West Pasco, though I don't think he has been involved in radio for quite some time. Then there is, or was Vera Kinkaid, who was kind of like a mother to all of us back then. The Open Line program featured mainly local people as guests, but among the more famous people who appeared on the program while in town in the 1970s were Jimmy Carter, campaigning for President; Tiny Tim; Nancy Reagan, while her husband was campaigning elsewhere in New Port Richey; and Arthur Treacher. Rick Adkins recalls that a driver dropped off Jimmy Carter at the station; Carter entered the station alone. He recalls that Ronald Reagan was giving a speech at Southgate Shopping Center and did not come to the station on the day that his wife appeared on Open Line. He says that perhaps a dozen Secret Service did a sweep of the station about 45 minutes before she arrived, checking desk drawers, purses, and everything else. She arrived with about a half dozen other agents. A newspaper advertisement on the station's tenth anniversary, October 31, 1973, showed pictures of the staff, which consisted of Thad Lowrey, Mark Wyatt, Bill Rossini, Doug Thompson, Steve McClure, Perry Flynn, Rick Adkins, Steve Diller, Chuck Long, Somers Smith, and Vera Kinkead. The 1976 Broadcasting Yearbook shows the following personnel: Don Armstrong Sr., President; Thad Lowrey, General Manager; Joe Jankowski, Commercial Manager; Don Armstrong Jr., Program Director; Rick Adkins, Music Director; Steve McClure, News Director; William Rossini, Chief Engineer. The format of WGUL AM 1500 was listed as MOR, talk; the format of WGUL FM 105.5 was listed as country and western. Station promotional material apparently from the late 1970s shows on-air personalities Dave Harrell, Gary Benjamin, Nancy Rigano, Bob Allyn, Matthew Johns, and JoAnne Hettle. The material indicated that Open Line aired from 9:30 to noon and again from 1:30 to 4 p.m. Allyn hosted the afternoon Open Line. Rigano did the 6 to 9 a.m. shift. Johns did the morning Open Line. Hettle did Hettle's Kettle and Woman's World, which aired from 4 to 5 p.m. In 1979, WGUL AM-FM was sold by Richey Airwaves Inc. to WGUL Inc. for $665,000. The seller was owned by Donald Armstrong (45%), his daughter Terry Graham (5%), Thad M. Lowrey (40%), and Sam Y. Algood (10%). The buyer was owned by Ralph B. Johnson (65%) and William H. Sanders (35%). Johnson was the former president of Rounsaville Enterprises, a group brodcast owner, and Sanders was vice president of Turner Communications Corp. In the early 1980s, the Music of Your Life format was heard on 1500 AM, and a 1960s oldies format was broadcast on 105.5 FM, which was known as "Pasco 105 1/2 FM" and had the call letters WPSO(FM). Open Line was hosted by (in order) Matthew Johns, Arthur Crofton, John Coleman, and Jeff Miller. Programming on the FM station was mostly automated, but a popular oldies request show hosted by Marvin Boone was heard on Saturday nights. In April 1983, Les Foerster was named program director of WGUL. He had been with the station about six months before receiving the promotion. Other announcers heard in the 1980s included Dan Henry, Tom Edwards, Michael John, and Bob Catron. Shortly after the simulcast operation began, the call letters of 105.5 FM were changed from WPSO(FM) back to WGUL-FM. In October 1983, the station line-up was as follows: 6-10 a.m., Les Foerster; 10 a.m. to 3 p.m., Nancy Rigano, 3-7 p.m., Dan Henry; 7-midnight, Gary Wayne. In addition, two shows were heard on AM 1500 only. They were Open Line from 10 a.m. to noon, hosted by Jeff Miller, and Open Line Classified from 12:30 p.m. to 1:30 p.m., hosted by Nancy Rigano. The Larry King Show was broadcast from midnight to 6 a.m. Rick Reighard was heard on weekends. Among the guests on Open Line in the 1980s were Rep. Claude Pepper, astronaut James Irwin, and Keenan Wynn. In November 1984, Johnson announced the sale of WGUL AM 1500 and FM 105.5 to Carl J. Marcocci of Clearwater for $1.725 million. Marcocci formerly owned WAZE 860 AM in Clearwater and other stations. He had begun his broadcasting career as a Pittsburgh disc jockey in 1957. In December 1985, Marcocci sold the AM 1500 station, which he had renamed WPSO(AM), to Thad Lowrey, who had been involved in the station when it began operation in 1963. Under Lowrey, WPSO 1500 AM continued Open Line and Swap Shop and carried network talk shows in the afternoons. In 1990, Lowrey sold WPSO 1500 AM to T. G. A. Communications, a corporation headed by Timothy and Diana Adkins. Adkins hosted Open Line and narrowly lost an election for Pasco County Commissioner while hosting the show. The station was later sold to the Hays Group Inc., headed by Page Peary, a son of the actor who played the starring role in The Great Gildersleeve. In October 1992, WPSO 1500 AM began broadcasting in Greek from 2 until 6 p.m. daily, and in November switched to a Greek format full-time. WPSO 1500 AM was later sold to AKMA Broadcast Network, Inc., headed by Sotirios Angelatos. In May 1986, WGUL, which was then broadcasting only on the FM band on 105.5, announced that it planned to purchase WAMA, licensed to Dunedin with transmitter in Safety Harbor, so that it could resume AM broadcasting, using the WAMA 860 kHz frequency. The announcement said the station hoped to be on the air on 860 by July 4. The call letters WGUL(AM) were approved for the 860 frequency and the Music of Your Life was again simulcast on AM and FM. Acquisition of the facility allowed WGUL to extend its coverage into Pinellas and much of Hillsborough county. In 1995, WGUL-FM changed frequencies from 105.5 to 96.1. WGUL had succeeded in getting the 105.5 frequency upgraded for high-power operation, and announced on Jan. 5, 1995, an agreement to sell the now more valuable 105.5 FM frequency to Citicasters, Inc., the owners of WTSP-TV Channel 10 and WXTB 97.9 FM. On Feb. 1, 1995, WGUL announced the purchase of WBSB 96.1 FM in Dade City. The station briefly broadcast on both 105.5 and 96.1 but ceased broadcasting on 105.5 MHz on March 8, 1995. In April 1995, WGUL studios were relocated from Counsel Square in New Port Richey to the Fountains in Palm Harbor. In 1997, WGUL-FM Inc. purchased WINV 1560-AM in Inverness, Florida, and for a time simulcast the Music of Your Life format on that station. On June 10, 1998, WGUL began simulcasting the Music of Your Life format on WAVQ 104.3 FM in Inglis. Operation on 104.3 was short-lived. In September 1998, WGUL's Music of Your Life was heard on 96.1 FM, 860 AM, and also on 1560 WINV in Inverness. In September 1998, WGUL announced it would sell the 96.1 FM frequency to Mega Communications Inc. of New York and would move to 106.3 MHz. WXOF-FM, which was then broadcasting on 106.3, would shift to a new dial position, 96.3 MHz. WGUL broadcast briefly on both 96.1 and 106.3, but on April 1, 1999, transmission ceased on 96.1. In 1999, WGUL Inc. purchased WKXY AM-930 in Sarasota and began simulcasting the Music of Your Life on 930 using the call letters WUGL. The simulcasting ended on March 4, 2002, when the Sarasota station adopted a syndicated talk format and changed its call letters to WLSS. In June 2000, Steve Schurdell was President and Carl J. Marcocci was Chairman of WGUL FM, Inc. On-air personalities included Les Foerster (mornings), Denny Bateman (middays), Bob Reynolds (afternoons), and Stu Hilder (evenings). Tom Fleming was heard on weekends. According to the FCC database in June 2000, WGUL-FM was operating as a Class C3 FM station on 106.3 MHz with an ERP of 10.5 kW. The transmitter site was located at Latitude N28:38:28 and Longitude W82:26:14. The city of license was Beverly Hills. HAAT was 154 m; HAMSL was 180 m. The owner was WGUL-FM, Inc.
At the same time, WGUL(AM) was operating on 860 kHz with a power of 2 KW, using three towers. Thee transmitter site was located at Latitude N27:59:55 and Longitude W82:42:01. The city of license was Dunedin. WPSO(AM) was operating on 1500 kHz with a power of 250 watts. The transmitter site was located at Latitude N28:15:32 and Longitude W82:43:45. The city of license was New Port Richey. In September 2000 WGUL(AM) was reported to be using the facilities of its construction permit which allows 5000 watts. The station was required to relocate one of the three towers at its transmitter site in Safety Harbor. On January 31, 2005, the AM-FM simulcasting ended. The call letters of the FM 106.3 station were changed to WJQB and the station adopted a syndicated mostly 1950s and 1960s oldies format, billing itself as the "True Oldies Channel.” The AM 860 station retained the WGUL call letters and continued its nostalgia format of adult standards. At this time WGUL-AM continued to be programmed locally in the daytime with on air personalities Les Foerster, Denny Bateman, and Bob Reynolds. On Feb. 28, 2005, Salem Communications Corporation, a leading radio broadcaster focused on Christian and family themed programming, announced that it would acquire WGUL-AM and WLSS-AM (930 AM, in Sarasota) from WGUL-FM, Inc., for a purchase price of $9.5 million. On the afternoon of Aug. 12, 2005, WGUL on air personalities Denny Bateman, Les Foerster, Bob Reynolds, and Tom Fleming said a final good-bye to the station's listeners. The last song played on WGUL was Thanks for the Memories, a duet by Bob Hope and Shirley Ross. Denny Bateman signed off with his traditional "Bye bye, and buy bonds.” At 5 p.m. temporary programming consisting of recordings of speeches by recent Republican presidents began. WGUL's official web site is 860wgul.com. On October 31, 1963, four local business men, Reginald Sims, Sam Allgood, Ron Tranter and Cliff Tranter, joined forces to bring the first radio station to West Pasco. Thad Lowrey was the first Program Director, later to become Station Manager. Thad stated that the voice of "The Golden Gull,” W. G. U. L. has concentrated its efforts on community service over the years. In 1964, Lowrey and Don Armstrong became the major stockholders in the company and have continued in control since that time with Don Armstrong, Jr., and Allgood holding a minority the business. Over the years the management's dedication to their public service role has been fully demonstrated. Listing their fund-raising efforts; On behalf of Parents Awareness Responsibility for their Largo hospital, five thousand dollars was raised in 1964; Hurricane Camille Relief in 1967, six truckloads of clothing, plus five thousand dollars; The Grassathon to obtain sod and a sprinkler system for West Pasco Hospital in 1964. These are but a few of the station's efforts in promoting good causes. In recognition these efforts, in 1970, the station was awarded the first Community Service Award given by the Greater New Port Richey Chamber of Commerce. In 1973, the station moved all their facilities into spacious new headquarters located on Highway 19 North at Avery Road. For the future, Lowrey states they plan a wider coverage on their F. M. station through increased power that will give them a voice throughout all of Pasco County. A highly popular station, W. G. U. L., dedicated to service, should continue to grow rapidly with the coming years. This article appeared in the New Port Richey Press on Oct. 12, 1961. This area's first radio station will go on the air next spring if approved by the Federal Communications Commission. W. C. Tranter, president of the corporation which plans to construct and operate the 250-watt daytime station reports it will be strictly a "community station" with emphasis on local news. If approved, WNPR will have a frequency of 1400 kilocycles. [This could be a misprint, intending 1500 - jm]. The FCC will hold a pre-hearing conference on the application Oct. 25, with the final hearing scheduled Nov. 27 in Washington. Tranter said it will be three or four months after the request is approved before the station can be built and start operating. While a site for the towers has been chosen just off U. S. 19, the group has still not selected a location for the new station's studio. Other officers in the corporation, Jasmin Properties, Inc., are Ronald Tranter, vice president; Sam Y. Allgood, Jr., treasurer, and Reginald Sims, secretary. This article appeared in the New Port Richey Press on June 13, 1963. Jasmine Properties, a local corporation, has been granted a license by the Federal Communications Commission to operate a radio station here, it was announced late last week by Jack McPherson, attorney for the group. The station, designed to be a daytime facility operating under the call letters, WNPR, probably will be in operation by September, and not later than November, McPherson reported. Members of Jasmine Properties Inc. are W. C. Tranter, Ronald Tranter, Reginald Sims, and Sam Y. Allgood, Jr., all of this city, who made application for the station in 1959. The transmitter will be located west of U. S. 19 on Palmetto Road, with the studio situated in the downtown business district. Two professionally trained people will be hired to assume operation of the station. McPherson stated, "The station will be a community-type facility, featuring music and news, with time available for public forums and civic activities and projects, but definitely not a political outlet,” Equipment for the transmitter will be ordered in the immediate future. According to the FCC telegram announcing granting of the license, the permit calls for a standard broadcast station to be operated on 1500 KC power of 250 W, daytime operation. The permittee shall accept any interference which might result from a subsequent grant of the application of Fletcher-Mitchell Corp. for an increase in the daytime power of station WTRL, Bradenton. This article appeared in the New Port Richey Press on Aug. 8, 1963. Jasmine Properties, Inc., a local corporation, recently granted a license by the Federal Communications Commission in Washington, D. C. to operate a radio outlet here, has been advised that the station will be WGUL. The station will be located at 1500 on the dial. An early September opening date is anticipated. Geographic location of WGUL will be at U. S. Highway 19 N. at Avery Rd. in the building formerly known as "The Malt-burger,” which is now being completely renovated to provide for the latest in modern facilities. Manager of WGUL will be Thad Lowrey, who said the station would not interfere with local TV reception. Members of Jasmine Properties Inc. are W. C. Tranter, R. C. Tranter, Reginald Sims and Sam Y. Allgood, Jr., all of New Port Richey. Application for the station was made in 1959. The station will be a "community-type" station, featuring music and news with time available for public forums and civic activities and projects and will definitely not be a political station. The corporation will locate the transmitter west of U. S. 19 on Palmetto Rd., and the broadcasting studio will be operated by professionally trained personnel. This article appeared in the New Port Richey Press on Oct. 31, 1963. The tower is up, the studio ready, and the turntables are spinning, so New Port Richey has another first -- its own radio station, WGUL, 1500 on your dial. Broadcasting began at 7:00 this morning (Thursday). WGUL will broadcast seven days a week from sunrise to sunset. Besides music, news, Associate Press releases and features, stock market news and weather, WGUL will concentrate on local news and happenings. Jasmin Properties, Inc. holds the permit for WGUL, which will be operated by Don Armstrong and Thad Lowrey, both of Port Richey. They will double as announcers as well as manager and program director, respectively. Assisting Armstrong and Lowrey as announcer and salesman will be Glen Dill of St. Petersburg and announcing part-time will be Chuck Roberts, a member of the local police department. Mrs. Don Armstrong is serving as office manager and Francis A. Tillman, Jr., is chief engineer. Officers of Jasmin Properties include Sam Y. Allgood, Jr., Reginald Sims, W. C. Tranter and R. C. Tranter. The 250-watt station will cover the area from Weeki Wachee to Dunedin and 30 miles east of New Port Richey. This article appeared in the St. Petersburg Times on Dec. 2, 1996. TARPON SPRINGS -- From a small office on the north side of Countryside Lanes bowling alley, the music of the Mediterranean is drifting out to the Tampa Bay area. The Aegean blue walls of the office are nearly covered with photos of Greek singers and Greek-American politicians, newspaper clippings and plaques of appreciation from local community groups. Thousands of records, CDs and video cassettes totter on shelves lining narrow hallways. Welcome to Greek Voice Radio. It's an AM connection for many Greek residents that was started almost 18 years ago by brothers Angelos and Sotirios Angelatos. And it's a typical morning at the radio station, with people rushing in and out of two small studios during the call-in talk show, Good Morning, Florida, accentuated by the trademark crows of the show's rooster. "Our idea is to service the community, especially small minority communities that aren't served by other mainstream stations,” said 48-year-old Sotirios, who goes by Sam, during a break from his daily show. The oldest duo in Greek radio in the Tampa Bay area, the Angelatos brothers got their start in 1979 by leasing several hours of air time a day from WHBS-FM 106.3 in Pasco County. Since then, they have worked to build a company called Angelatos Communications Corp. that leases two AM stations in Pinellas and Pasco counties. The two stations -- WXYB-AM 1520 in Indian Rocks Beach and WPSO-AM 1500 in New Port Richey -- broadcast their mix of Greek talk shows, music, news and self-help programs from Bradenton to Brooksville. WPSO is exclusively Greek programing, and is mostly broadcast in the Greek language, tailored to the large Greek population of Tarpon Springs and Pasco County. WXYB, broadcasting south of Clearwater, also has Polish, Serbian, Spanish and Italian programing. The stations are on from sunrise to sunset, and the Angelatos brothers say at least 100,000 Greek listeners tune in from time to time. "For people who don't know English, this is what makes them happy,” Angelos said. For the past year, the brothers also have been working on getting a television channel, ITC 48, to broadcast international programing to the same area. The station currently shows Greek movies, local Greek news and Greek cartoons. But it also carries news programs from Canada, Newfoundland, Germany, Italy, Great Britain and an Arabic news service. The brothers are trying to offer the station, which currently can be received by antenna only, in future cable packages. Local cable companies cannot confirm the status of negotiations. Angelos creates all of the television station's professional computer graphics and local advertisements in an office the size of a large walk-in closet. He wrote the computer programs that automatically record broadcasts from news services the station has contracted with. The brothers make a living by selling modestly priced advertisements or air time to people who want their own radio programs. For an ad, one minute on the radio costs about $30 and on ITC 48 about $70. But some people who are listening don't always like what they hear. The brothers have antagonized some members of the local Greek community, who feel the pair intentionally created controversies for the benefit of their talk shows. Some say the brothers, who are from the island of Chefalonia, don't see Greek issues the same way as people from other regions of Greece. Some on-air callers make scandalous accusations about other people and groups, say people who listen to the station regularly. But the Angelatoses insist that they don't take sides on issues, local or international. They say they provide a forum. After several years of monopoly, the brothers are now facing competition on other AM stations. WLVU-AM 1470 in Palm Harbor, for instance, has expanded its Greek programing over the past year. Another station, WTAN-AM 1340, turned from Spanish to predominantly Greek programing in 1991. But even those who criticize the Angelatos brothers admit they have raised lots of money for good causes along the way. Quests to fund surgical operations, pay for funerals or other charitable causes have been the subject of news articles on the station over the years. Tarpon Springs resident George Platanias is one of many people helped by donations to Greek Voice Radio after the brothers made an appeal on his behalf. Platanias, who broke his neck in a 1975 car accident, is a quadriplegic. Money raised by Greek Voice Radio bought the 59-year-old a van that he can control with his head and that has a wheelchair lift. The station also gives a lot of groups free air time to advertise upcoming events. The Hellenic Voters of Pasco County used the station to help naturalize about 250 Greek citizens over the past three years, said Gus Tsilionis of the Hellenic Voters. A typical day at the Greek Voice Radio is very much a family affair. The brothers became Canadian citizens as teenagers and then emigrated to the United States. They are both citizens and family men here now. They split their company tasks, with Angelos acting as programing director for the radio and television stations and Sam as general manager. Their wives pitch in as disc jockeys. Unlike the majority of shows on Greek Voice Radio, Darlene introduces songs on her program in English. The Angelatoses have ambitions. They are planning a World Wide Web page. They would like to buy a building for their company. They hope ITC 48 is a success. This article appeared in the St. Petersburg Times on Sept. 10, 1998. PALM HARBOR -- WGUL-FM Inc. on Tuesday signed an agreement to purchase country radio station WXOF-FM in Citrus County from Portland, Maine, broadcaster John W. Bride. WGUL, which plays big band music and adult standards, already owns WINV-AM and WBKX-FM in Citrus. The deal is the latest in a flurry of radio station consolidations that have occurred in the Tampa Bay area since Congress passed the Telecommunications Act in 1996. The law loosened the restrictions on the number of stations owners could buy. Schurdell said his company won't change the programing at WXOF but will try to improve the station's signal in Hernando and Pasco counties. WXOF, which broadcasts in Citrus and Marion counties at 106.3, has applied to the FCC to move its antenna 12 miles south of Beverly Hills and increase its power to 50 kilowatts. The station currently broadcasts with a power of 25 kilowatts. "More power means more coverage, which means more listeners,” Schurdell said. Under a brokerage agreement, WGUL will take over operation of WXOF immediately. The sale of the station, however, is subject to Federal Communications Commission approval. Schurdell declined to disclose the sale price. WGUL FM Inc., owned by the Carl Marcocci family of Clearwater, says it is the largest privately owned radio group broadcasting in Tampa Bay. In addition to the Citrus stations, the company owns radio stations WGUL-AM 860/96.1 FM and WRFB in Cocoa. Bride could not be reached for comment Wednesday. This article appeared in the St. Petersburg Times on Oct. 2, 1998. PALM HARBOR -- WGUL-FM intends to move farther up the dial. The Carl Marcocci family of Clearwater has sold WGUL-FM's license and frequency, 96.1, to Mega Communications Inc. of New York City. Mega owns radio stations in Philadelphia, Washington, Boston and WBDN-AM, a Tampa Spanish language station. Under the deal, WGUL-FM will move to 106.3; and country radio station WXOF-FM in Citrus County, which WGUL Inc. has an agreement to purchase, will move to 96.3, a new frequency. Moving to the new frequency is "going to improve our signal in Pasco and Hernando counties, and we will still have excellent coverage in Citrus,” said WGUL-FM Inc. president Steve Schurdell. WGUL will retain its adult standards programming, Schurdell said. The changes will occur over the next 90 days and are subject to approval by the Federal Communications Commission. NEW PORT RICHEY-The times they are a-changin'. Beginning Monday, radio station WGUL-FM 106.3 on will have a new name and a new sound-and a famous name in area radio. After some 20 years of adult standards for the 50-plus age group, the radio station will switch to "True Oldies" for somewhat younger listeners who appreciate the dawn of the rock 'n' roll era. "We're focusing on targeting a demographic just a little bit younger to reach the majority of the population in the Tampa Bay area,” said Steve Schurdell, managing partner of the Gull Group, the station's owners. Pasco and Hernando counties have changed in recent years "from primarily retiree counties to a more demographically diverse area,” Schurdell noted. The old "adult standards" format concentrated on classics such as the music of Perry Como, Frank Sinatra and the big bands. The new sound will air music from the 1950s and '60s with tunes from Roy Orbison, Dion and the Belmonts, Chuck Berry and other musicians of the era. With the change, WGUL-FM will become WJQB-FM. Sister station WGUL-AM will remain the same and will retain the "adult standards" formula with the same disc jockeys. "True Oldies" will air from New York and feature Scott Shannon. Shannon and partner Cleveland Wheeler pioneered a mix of music, comedy, news and sports with their "Q Morning Zoo" show on Q 105-FM in Tampa in the early 1980s. Shannon later took the format to New York and national syndication. WJQB disc jockeys will be involved in local feature spots but their role is still "a work in progress,” Schurdell explained. The on-air staff has been supportive of the format change, Schurdell said. Denny Bateman, in particular, "is very active in programming the new format,” which will be music driven, rather than focusing on personalities, Schurdell said. WGUL's territory ranges from central Pinellas to Citrus counties. It has about 150,000 listeners, Schurdell said. Its licensee and founder of the Gull Group, which owns radio stations in Florida, is Carl J. Marrocci, who bought it in 1984. It was founded in New Port Richey in 1963 and was the area's first radio station. This article appeared in Hernando Today on Dec. 22, 2006. SPRING HILL — True to his character, Carl Marcocci died Thursday night after handing out Christmas bonuses and treating his radio staff to a steak dinner. The party broke up at the Outback Steakhouse on Commercial Way around 7:20 p.m.
His employees left for Citrus County. Mr. Marcocci would have gone to his home in Clearwater, where his wife of 43 years was waiting, but his Mercedes coupe had scarcely cleared the parking lot when it jumped the curb, crossed a long vacant lot, smashed through a chain link fence and punched through the metal door of a storage unit. The Florida Highway Patrol says he died at the scene, but troopers are waiting on an autopsy to establish the official cause of death in the mysterious accident. Meanwhile, the radio world in Tampa Bay is mourning the loss of the 68-year-old radio mogul. “He was a true master of broadcasting,” said Steve Schurdell, part owner of Mr. Marcocci’s radio network. At the time of his death, Mr. Marcocci owned the Palm Harbor-based oldies station, 106.3, Citrus 95 in Homossasa and The Fox, 96.3. He also owned the AM radio station WINV 1560. When Schurdell joined the team in 1985, he was a real estate agent who had no experience in broadcasting. Mr. Marcocci patiently tutored him behind the microphone and eventually offered Schurdell a chance to manage a station. Mr. Marcocci’s own radio career began in his native Pittsburgh when he was 15 and deejayed sock hops. Schurdell remembers when a national syndicate offered Mr. Marcocci big money for his radio stations. Mr. Marcocci seriously considered it for a short time. In typical fashion, Mr. Marcocci suggested lunch to mull it over. The choice was clear for Mr. Marcocci. “There’s nothing I want to do but radio,” he told Schurdell. But no matter how much passion Mr. Marcocci had for radio, friends say his family always came first. His two sons, Russell and David, and his daughter, Sharon, all worked at his radio stations at one point. David died in January. “He loved his kids very much,” said Richard Spires, general manager of the Citrus County radio station. Spires was at Thursday’s night dinner, along with the station manager and her husband. He didn’t know anything was wrong until an anxious Betty Lou Marcocci called him around 7 a.m. Friday morning. It wasn’t until 11:30 a.m. that Spires learned that Mr. Marcocci had died. “I still can’t believe it,” he said, his voice choking with emotion. Radio was good to Mr. Marcocci and he wasn’t hurting for money. But Mr. Marcocci was “generous to a fault,” Spires said. One example of a lifetime of generosity happened around Thanksgiving, when one of the Citrus County employees lost a daughter. He wrote a substantial check for funeral expenses “without blinking an eye,” Spires said. Steve Manuel, general manager of Brooksville’s WWJB 1450 radio, met Mr. Marcocci when he sold Citrus 95 to him.